A man from Denmark has been handed a six-month conditional prison sentence for spreading information about Popcorn Time. In what is being described as a first for Europe, the man was convicted after telling people how to download, install and use the movie streaming service. He was also ordered to forfeit $83,300 in ad revenue and complete 120 hours community service. 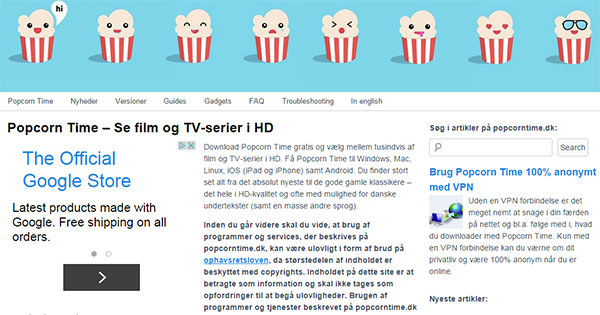 In August 2015, police in Denmark announced they had arrested a man in his thirties said to be the operator of a Popcorn Time-focused website. Popcorntime.dk was subsequently shut down and its domain placed under the control of the state prosecutor. “The Danish State Prosecutor for Serious Economic and International Crime is presently conducting a criminal investigation that involves this domain name,” a seizure notice on the site reads. In a circumstance like this, it’s common to conclude that the site was offering copyright-infringing content or software. That wasn’t the case though, not even close. PopcornTime.dk was an information resource, offering news on Popcorn Time-related developments, guides, plus tips on how to use the software while staying anonymous. Importantly, PopcornTime.dk hosted no software, preferring to link to other sites where the application could be downloaded instead. That didn’t prevent an aggressive prosecution though and now, two-and-half years later, the verdict’s in and it’s bound to raise more than a few eyebrows. On Wednesday, a court in Odense, Denmark, handed the now 39-year-old man behind PopcornTime.dk a six-month conditional prison sentence for spreading information about the controversial movie streaming service. Senior prosecutor Dorte Køhler Frandsen from SØIK (State Attorney for Special Economic and International Crime), who was behind the criminal proceedings, described the successful prosecution as a first-of-its-kind moment for the entire region. “Never before has a person been convicted of helping to spread streaming services. The judgment is therefore an important step in combating illegal streaming on the Internet and will reverberate throughout Europe,” Frandsen said. According to a statement from the prosecutor, the 39-year-old earned 506,003 Danish Krone ($83,363) in advertising revenue from his website in 2015. In addition to forfeiting this amount and having his domain confiscated, the man will also be required to complete 120 hours of community service. “The verdict is a clear signal to those who spread illegal pirate services. The film industry and others lose billions in revenue each year because criminals illegally offer films for free. It’s a loss for everyone. Also the consumer,” Frandsen added. The convicted man now has two weeks to decide whether he will take his appeal to the Østre Landsret, one of Denmark’s two High Courts.